30-minute marinara: 6 ingredients; sugar-free | 30-minute marinara: 6 ingredients; sugar-free – oh, that's tasty! I found this make-ahead marinara sauce recipe in a Good Housekeeping magazine in 2009, and it’s been my go-to pasta/spaghetti/pizza/whatever sauce ever since! 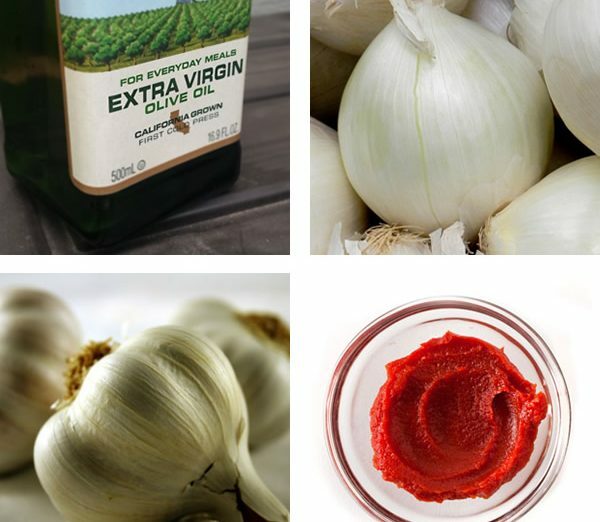 Tomato Puree (Water, Tomato Paste), Vegetable Oil (Contains One Or More Of The Following: Soybean Oil, Corn Oil), High Fructose Corn Syrup, Salt, Dried Onions, Extra Virgin Olive Oil, Romano Cheese (Cow’s Milk, Cheese Cultures, Salt, Enzymes), Spices, Natural Flavor. Of course, the classic: Serve it with meatballs or browned beef, and pasta or zucchini/squash noodles. Use it as a basic pizza sauce. Dollop some heated marinara over cooked green beans or zucchini. Optional: add a little grated Parm on top. Yum! You might get veggi-phobes to like this one! Top a grilled chicken breast with some marinara and a slice of mozzarella cheese, and heat till the cheese melts. Brown some crumbled sausage, then add marinara and heat through. Toss with some cooked store-bought tortillini. Optional: add chopped spinach. Add it to a soup of broth and vegetables — adding meatballs, sausage, or chicken is optional — and you’ve got something close to minestrone. Italian tomato butter: Blend 1 stick softened butter and 1/4 cup marinara sauce; refrigerate till solid, and let it melt over hot vegetables, fish, or grilled chicken. Pasta alla vodka: just add cream and vodka for this classic Italian sauce. Simmer 1/2 cup heavy cream and 3 cups marinara sauce in a skillet for 3 – 5 minutes. Remove from heat and stir in 2 to 3 tablespoons vodka. Optional: cook a few minutes to burn off some of the alcohol. Toss with cooked pasta. Shrimp or lobster is a nice add-in, too. 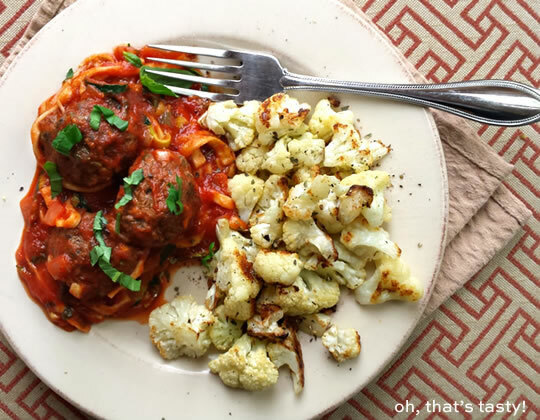 PALEO pasta alla vodka: Yep! No cream, no vodka, no pasta — still tastes great! Recipe here. This sauce tastes best if you can get fresh basil, but if you can’t, just substitute two or three tablespoons of basil pesto. And if you make it without pesto (because of the cheese), this is Paleo friendly and Whole30 compliant! And perfect for anyone who’s trying to go sugar-free. In a 4-1/2 quart sauce pan, heat the olive oil over medium heat, and saute the onions till soft and just starting to brown, about 10 to 12 minutes. Stir occasionally. Turn up the heat and cook till the mixture boils, then turn the heat back down to medium/medium-low and simmer for 15 minutes, stirring occasionally. Stir in the basil and minimum salt and pepper. Taste and adjust seasoning if needed. I like to divide the batch into one-cup units, but that’s for a household of two. For a bigger family, you might want to go with two-cup or larger containers. 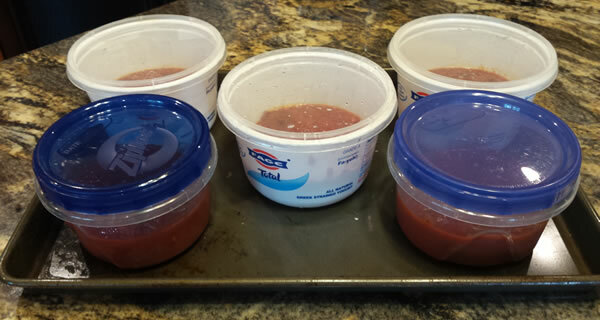 I pour it into individual plastic containers then put those on a cookie sheet and get it as level as possible in the freezer, so the frozen sauce will be an even thickness. Then once they’re frozen, I pop them out of the plastic containers and into sandwich-size baggies, then seal those and put them in a gallon baggies. This takes up less space than the hard containers. Putting it in the larger baggie makes it easier to keep them all together in the freezer (easier to find and make sure no one is left behind), plus it’s an extra layer of protection in the freezer. I label the large bag so I don’t end up wondering later if that’s marinara or chili. It keeps well in the freezer and reheats beautifully! It may separate while thawing, but just stir it together and it’ll be good as fresh. To thaw, you can use the microwave, or set it in the fridge for several hours, or just heat it slowly at first in a sauce pan, then break it up and turn up the heat as it begins to thaw. You are gonna love this sauce! It tastes really fresh and light, and knowing it’s completely free of sugar, corn syrup — better yet! I used a combination of two brands of crushed tomatoes, so I could test them against one another, at least before they went in the sauce. 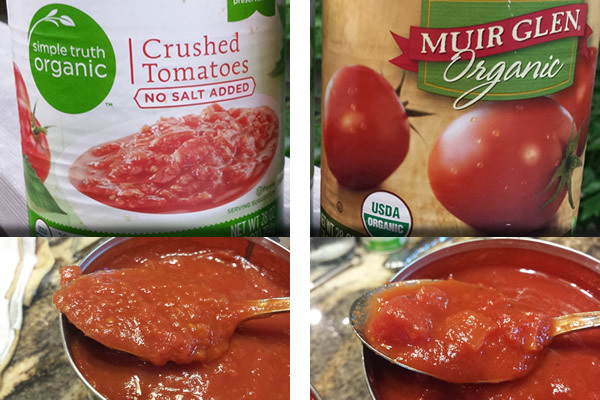 On the left, Dillons/Kroger organic store brand; on the right, Muir Glen organic. You can see the second has a little chunkier texture and a slightly redder color, both of which I like. It tasted a little better, but that wasn’t really a fair fight: the store brand was plain and no salt added; the Muir Glen had salt and other seasonings. I would use either one again. Don’t lose this recipe: Pin it!